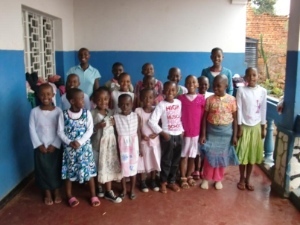 In late 2010 we received a large number of gifts generously donated by many supporters in the UK and brought to us as a part load of a container provided and paid for by the National Police Aid Convoy Organisation. We are so very grateful for their help, as until now we have depended upon visitors to bring things out for us in their luggage. 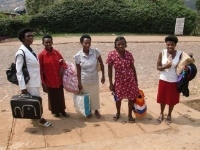 I returned to Kinamba in mid-January 2011 to find a huge store of wonderful things which will help us in so many ways. 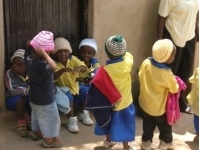 We have been gradually working through them and distributing the gifts, organising how we can arrange training with, for example, the knitting and sewing machines and arranging ‘gift days’ for the wide range of clothing and shoes for all ages. The poorest and most vulnerable people of our community will benefit enormously from these things. First of all, on behalf of the school in general, I say a huge thank you for the paper, notebooks, toys and children’s books. They are an invaluable addition to our stock and the teachers and children will make good use of them in the years to come. We began by giving out some of the clothes and shoes to the staff and the women of our co-operative. They were thrilled with everything and were especially happy with the more personal items. Many of our staff and the people in the co-operative have shocking stories to tell, some are genocide orphans or widows themselves, .so it feels good to bring a smile to their faces. Life is very hard here and everything is very expensive. They had great fun trying on the bras and Epiphanie, our senior teacher loved the hat, though we took it from her to put in the dressing up box! Here is Agnes, one of the members of our co-operative. The women of the co-operative had great fun trying on the underwear! Thank you very much for those and for all the other things for the co-operative, which we have yet to sort out. Next we gave out shoes to the children. They too are highly prized and desperately needed, especially trainers. 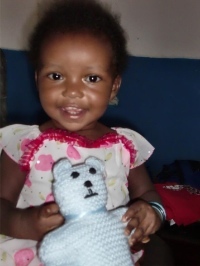 A wonderful and unexpected delight was the gift of hand – knitted things- we love them! I arranged a ‘baby day’ when the poorest of the local people were invited to come. We gave out blankets and some clothes to the mothers as well as the babies. We have given out some of the fabulous sports clothing we received. 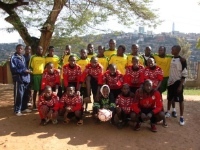 Rwandans love their football and these are just two of the local teams which will be receiving team kits. Perhaps the most exciting of all is the climbing frame, which will bring so much pleasure to so many children. We took the Nursery one class to try it out and it was interesting, but also sad to see the children’s reactions. They had no idea what it was, but soon caught on – they were afraid of climbing the ramp and the rope, and were not at all prepared for the bumpy landing when they came down the slide, but you can see from their expressions how much they enjoyed it. I do not know who donated this for us, but wherever you are, and whoever you are, I can assure you that we will enjoy hours of fun using it and on behalf of the children in the Kinamba Project, I thank you very much. 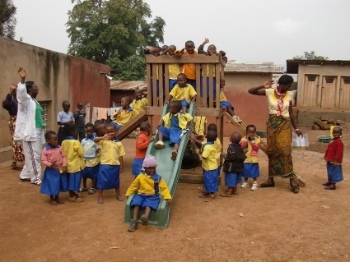 Fun is not necessarily part of their lives here – even the smallest children get a can of water to carry, and I see them sweeping the outside area where they live and doing other jobs, but rarely see them just simply playing. We have distributed a lot of girls’ clothing, shown below. Our children are very needy, they are so happy to receive such pretty things and they waited patiently to be given something in their turn, I was very touched by them, it seems so easy to bring such pleasure to a few. And so very worthwhile. Our adventure castle will soon have a permanent site, our space is limited and today we have started making blocks to build the boundary wall, this is temporarily taking over the space, but we will get there very soon. It is almost impossible to find the words to express our gratitude. We have been given a great lift. We now have a store of essential school supplies and a library of reading books in each class. Other gifts will give us hours of fun. The people of the co-operative love the new electric sewing and overlock machines, and we can now organise training with the knitting machines which we received so that a new group of people have a chance to earn money for themselves. On behalf of the people of Kinamba I say thank you again and again, you have made such a difference to our work and we are very grateful.